Just as humans can follow complex social situations in deciding whom to befriend or to abandon, it turns out that animals use the same level of sophistication in judging social configurations, according to a new study that advances our understanding of the structure of animal social networks. The study, which appears today in the journal Animal Behaviour, is the first in which researchers applied a long-standing theory in social psychology called "structural balance," which is used to analyze human relationships, to an animal population to better understand the mechanisms that determine the structure of animal social groups. 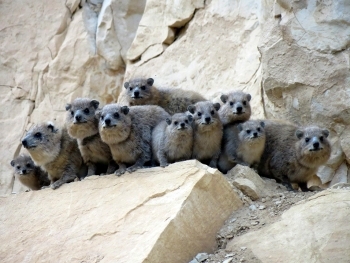 Researchers analyzed social bonds in behavioral data from a long-term study of the rock hyrax, a small mammal that lives in colonies across Africa and the Middle East. In the study, the hyraxes tended to form balanced triads and changed unbalanced triads to balanced triads over time. However, new individuals in the population - new pups or males that migrate into the network - introduced social instability by often forming unbalanced triads, causing the network as a whole to retain some level of instability. The study also found that contrary to classical structural balance theory, the "enemy of my enemy is my enemy" configuration was actually a stable configuration. Citation: Ilany A, Barocas A, Koren L, Kam M, Geffen E. 2013. Structural balance in the social networks of a wild mammal. Animal Behaviour. Published [online] 21 April 2013.